SELECT application. 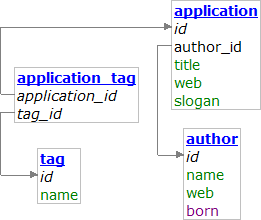 * FROM application LEFT JOIN author ON application.author_id = author.id WHERE author.name LIKE ? UPDATE application SET title = 'X' WHERE id = ? DELETE FROM application WHERE id = ?